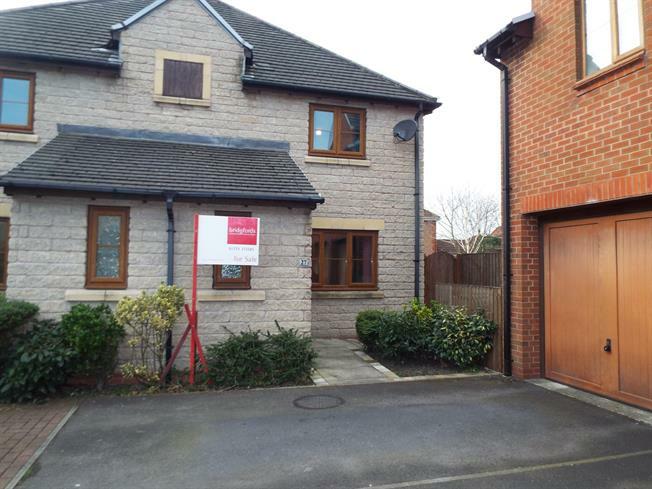 3 Bedroom Semi Detached House For Sale in Preston for Offers in the region of £165,000. Superbly presented modern semi detached house set in a great position on the Holland House Development, entrance hall, large lounge, modern fitted dining kitchen, ground floor WC, three well proportioned bedrooms, master bedroom provides a walk-in double wardrobe, attractive white family bathroom suite, stone flagged easy maintenance front garden, driveway leads to garage for off road parking, good sized sun trap rear garden with large decking area ideal for outside dining and stone gravelled section, large area laid to lawn to the side with Indian sandstone patio and stone cobbled area with fruit tree..
Laminate floor. White spindled staircase leads to the first floor accommodation. Superbly appointed lounge with laminate floor. Under stairs storage cupboard. Double glazed window to the front. Square archway to Dining Kitchen. Large well designed modern fitted dining kitchen with a range of wall and base units with complimentary work surfaces. Inset 1.5 bowl stainless steel sink unit. Built-in double electric oven with four ring gas hob and chimney hood houses extractor fan with light. Integrated fridge/freezer. Space for dishwasher and space for washing machine. Wall mounted gas boiler. Part tiled walls. Two sets of LED spotlights. Double glazed window to the rear elevation. Double glazed patio doors leads to the rear garden. White wash hand basin and low level WC. Vinyl floor. Double glazed window to the front elevation. Loft access point. Airing cupboard housing hot water cylinder. Well proportioned master double bedroom with a large walk-in double wardrobe. Double glazed window to the front. Well appointed second bedroom with laminate floor. Double glazed window to the rear elevation. Good sized third bedroom with double glazed window to the rear elevation. Attractive white family bathroom suite consisting of panelled bath with over head shower attachment with glass shower screen, pedestal wash hand basin and low level WC. Amtico flooring. Part tiled walls. Shaver point. Double glazed window to the side elevation.